Google CEO Eric Schmidt was one of the many Silicon Valley leaders to add his name to the NoOnProp8 advertisement that ran in the San Jose Mercury News a couple of days ago. 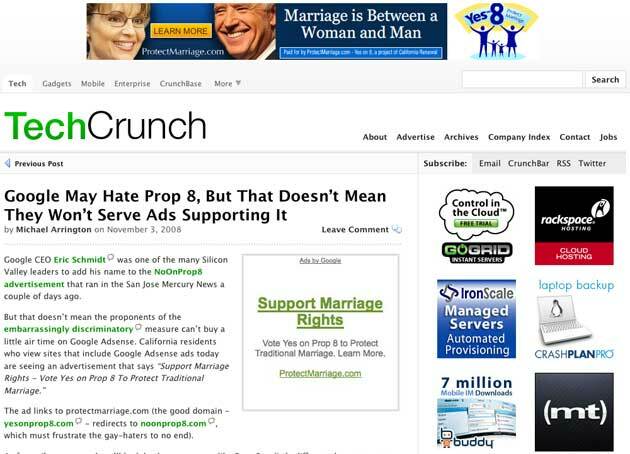 The ad links to protectmarriage.com (the good domain – yesonprop8.com – redirects to noonprop8.com, which must frustrate the gay-haters to no end). As far as I’m concerned, we’ll look back on measures like Prop 8 as little different than attempts to stop Women’s Suffrage or the Civil Rights movement of the 50’s and 60’s. Denying a fundamental right to a person – such as marriage – is hateful and backwards. Google doesn’t have any obligation to run ads like these, and I believe they would be correct in banning it. Update: We’re also seeing these ads on TechCrunch, although we can’t tell if they’re coming from our ad partner Federated Media or Google (FM syndicates filler ads from Google). Trying to take them down. Update 2: they’re coming through Google, and we’re going to try to filter them out now.